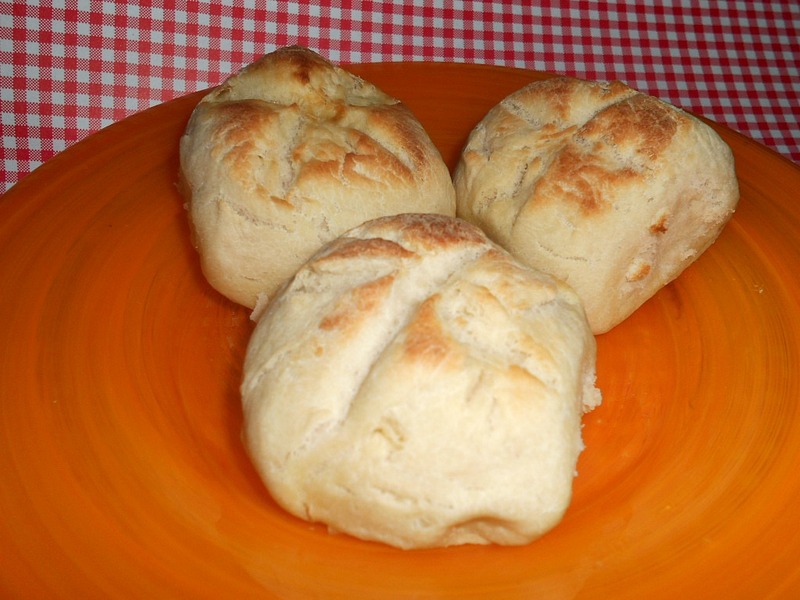 Whenever we are having pasta for dinner I like to make bread or rolls to go with it. I don’t always have the time after work to make the dough, let it rise, roll it out, let it rise again, and then bake it. 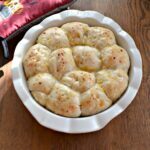 When I saw this simple dinner roll recipe from Sprinkles of Parsley I was excited to try it. It has yeast in it, but it doesn’t require hours of rising. The rolls came together quickly and easily. They smelled wonderful as they baked up in the oven. I was a little concerned about them being heavy rather then light and fluffy as they get with the dough risings. The finished rolls were in between heavy and light. 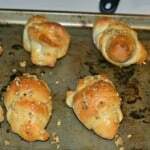 They tasted really good, especially for having been made so quickly. I enjoyed the ones topped with the garlic. The insides were soft and the outsides were crisp, golden brown. 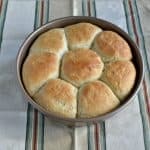 While they aren’t as good as homemade rolls that have gone through the rising process, these rolls were certainly better then store bought rolls. I’d make these rolls again, especially if I don’t have a lot of time and want something homemade. 2. In a mixing bowl, combine water, yeast, and honey. Stir until the honey dissolves. Place the mixing bowl on the stovetop and cover with a dishtowel. Let the bowl rest for 15 minutes. 3. After 15 minutes the mixture should be foamy. Stir in the baking powder and salt until they are well combined. Begin adding in the flour ½ cup at a time, stirring well after each addition. You can also use a stand mixer at this point. Continue adding flour until a dough forms. 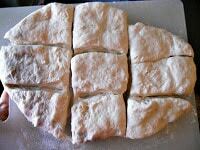 Turn onto a floured surface and knead for 3-5 minutes. 4. Press the dough into a rectangle and cut into three strips long ways, then three strips the other way so that you have nine pieces. 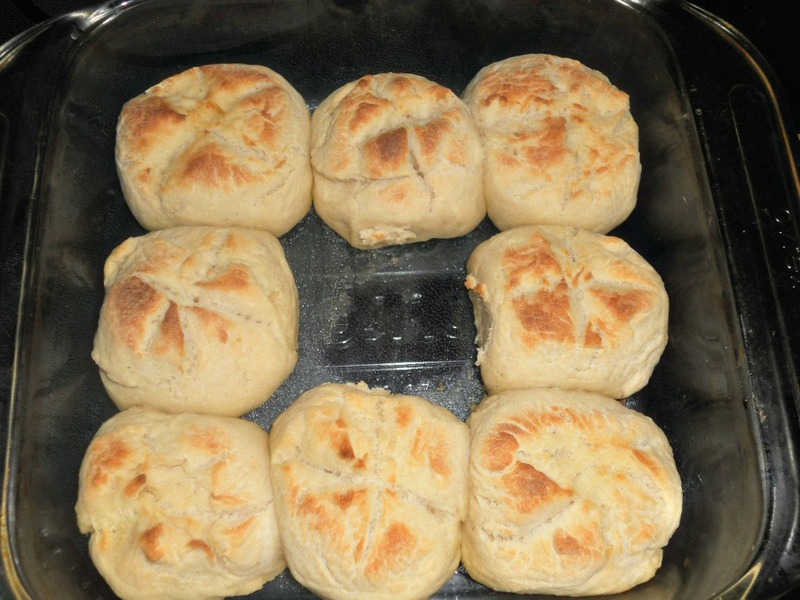 Shape each piece into a ball then place in an 8 x 8 baking dish that has been buttered on the bottom. 5. Cut an X into the top of each roll. Melt the butter and brush over top of the rolls. 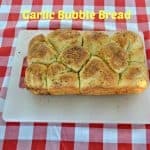 Top with garlic and Parmesan cheese if desired. I don’t make rolls often enough because I never have time to let them rise – this sounds like the perfect solution. And the garlic topped ones would be great with pasta.